Anchoring the monthly session at Tir na nOg, 1324 Hamilton Ave., from 3-6pm. Kathy playing harp for the opening of Artis Senior Living from 3-6pm. Monthly ceili for the New Castle County Irish Society, 1301 S. Rodney St., from 2-5:30pm. Sets and ceilis are on the dance card. See website for other details. Anchoring the monthly session at Tir na nOg, 1324 Hamilton Ave., from 3-6pm. Cancelled due to the Super Bowl. Go Eagles! Monthly ceili for the New Castle County Irish Society, 1301 S. Rodney St., from 2-5:30pm. .
Concert for the South Jersey Irish American Cultural Society, American Legion Hall, 560 New Jersey Ave. at 7:30pm. Kathy performing on the harp for the Irish American Business Chamber & Network at Stotesbury Mansion at 6pm. The Philadelphia Ceili Group's Friday night Ceili at the Irish Center, Carpenter & Emlen Streets, from 8-11pm. Concert at the Monmouth County Library, Eastern Branch, 1001 NJ Rt. 35, at 2pm. Free. Sober St. Patrick's Day celebration by the Delaware Valley chapter of Comhaltas Ceoltoiri Eireann, 4-7pm in the High Point Bank Barn at St. Peter’s Church in the Great Valley. Tickets at www.SSPDPhilly.com. A concert at St. Francis of Assisi Community Center at 12pm. Our annual St. Patrick's Day outing at Murphy's Market, 666 Stokes Rd. 11am-4pm. Playing for the Sunday service at the Church of the Loving Shepherd, 1066 S New St at 10am. With the Next Generation of Irish Music as well as the Irish Seisiun group at the New Jersey Folk Festival. Music for American Studies graduation reception at Woodlawn on the Douglass campus from 4-6pm. Performing at Eckley Miners Village from 2-4pm. We're at the Somerset Folk Harp Festival at the Sheraton Parsippany in a variety of roles. traditional music. See website to see if seats are still available or get on our waiting list. Performing at the 45th annual Philadelphia Ceili Group Irish Music and Dance Festival. Kathy playing harp for a wedding at The English Manor from 3:30-4:30pm. Kathy playing harp for the Gift of Life Donor Remembrance Ceremony at the Executive Banquet & Conference Center at 12:30pm. Kathy playing harp for the Gift of Life Donor Remembrance Ceremony at the Crowne Plaza at 12:30pm. Christmas ceili for the New Castle County Irish Society, 1301 S. Rodney St., from 2-5:30pm. Sets and ceilis are on the dance card. See website for other details. Monthly ceili for the New Castle County Irish Society, 1301 S. Rodney St., from 2-5:30pm. Kathy playing harp from 6:30-9:30pm at the open house for Our Lady of Lourdes Church, 500 Greentree Rd. Special children's concert at 11am at the Verona Public Library, 17 Gould St. Regular concert at 2pm for the family! Free. Kathy performing a harp program for the Willingboro Friendship Guild at the Senior Center, Levitt Parkway & Kennedy Way at 1:15pm. Friends of the Library host a concert at the Cranford Community Center, 220 Walnut Ave., at 7:30pm. Free. Playing music for the church service at the Church of the Loving Shepherd. Kathy playing harp for an afternoon tea at the Our Lady of Angels Convent at 2pm. Monthly ceili for the New Castle County Irish Society, 1301 S. Rodney St., from 2:30-5pm. Sets and ceilis are on the dance card. See website for other details. We're performing at the New Jersey Folk Festival, Douglass campus at Rutgers University. We'll also be anchoring the Irish session on the Shore stage. Kathy is performing on the harp at Sayen Gardens from 10am-1pm for their all-day Azalea Festival. Kathy playing at a wedding at Bonnet Island Estate at 6:30pm. We're the ceili band for the 4th Friday ceili at the Irish Center, Commodore Barry Club, Carpenter & Emlen Streets at 8pm. Performing for the Patchtown Days event at Eckley Miners Village from 12:30-1:30pm and 3-4pm. Teaching and performing at the 17th annual Somerset Folk Harp Festival. See website for details and to sign-up. We're the music anchors, along with Grainne Hambly, and will be shepherding a 45-person guided tour of Ireland for 10 glorious days of sightseeing, history and great traditional music. Performing at the 43nd annual Philadelphia Ceili Group Irish Music and Dance Festival. Harp-centric concert in Foy Hall at Moravian College from 4-5pm. Down Jersey concert series at Cumberland County College at 8pm. Private event for the University Barge Club at the Irish Pub, 23rd & Walnut, from 6-9pm. Kathy is playing harp a Valentine's lunch at Cadbury. Kathy playing harp for a reception at the South Plainfield Library from 8-9pm. South Jersey Irish monthly Hoolie from 8-11pm at the Knights of Columbus Hall, Broad & Elm Sts. Kathy playing harp for the St. Patrick's Day Association's Grand Marshall's dinner at the Doubletree hotel. Ceili band for the St. Patrick's Day ceili at the Irish Center, Commodore Barry Club, Carpenter & Emlen Streets at 8pm. Concert at the Verona Public Library, 17 Gould St, at 3pm. Free. Performing at a private wedding at the Mansion. Kathy performing on harp at the Willow Grove Presbyterian Church, 1961 Raritan Ave. at 1pm for an afternoon tea. Anchoring the Irish session at the New Jersey Folk Festival, Douglass campus at Rutgers University at 1pm. Playing the ceili at the Philadelphia Fleadh. We're performing for the Circlewood Coffeehouse reunion at the Unitarian Church, Kings Hwy. Concert starts at 7pm. Playing a private cocktail reception and concert at Merion Tribute House for Ardmore Banking Advisors from 5:30-8:30pm. The 16th annual Somerset Folk Harp Festival at the Hilton Parsippany, 1 Hilton Court. We'll be performing in the cafeteria from 12-4pm at St. Mark's High School, 2501 Pike Creek Rd. while the Delaware Feis is going on. Patch & Bob Glennan will join us. We'll be performing a private function at the Knights of Columbus Hall from 2-5:30pm. Performing at the 42nd annual Philadelphia Ceili Group Irish Music and Dance Festival. Kathy is playing a wedding at the Bouman-Stickney Farmstead at 3pm. Kathy's Harpers' Escape Weekend. Sign-up in advance to participate. Kathy is playing a wedding at the Water Witch club at 3pm. Kathy playing at a wedding at 3pm. We're the ceili band for the South Jersey Irish Society's monthly hoolie at the Knights of Columbus Hall at 8pm. Private concert for the residents of Waverly Heights at 4:30pm. Kathy playing the harp for the St. Patrick's Day Observation Committee's annual Grand Marshall dinner at the Doubletree hotel at 5pm. Concert at the Bridgeton Public Library, 150 East Commerce Street at 7pm. Free. Concert at the Madison Public Library, 39 Keep St, at 2pm. Free. NO SESSION this month at Tir na nOg, 1324 Hamilton Ave. See you in May. Performing during the church service at the Church of the Loving Shepherd, Front. St., at 10am. 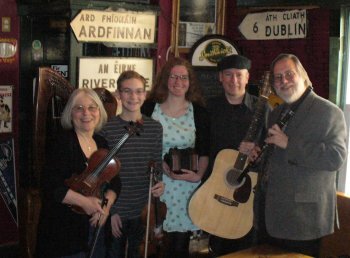 We're the ceili band for the Philadelphia Ceili Group's Friday night Ceili at the Irish Center from 8-11pm. Our ceili band will be playing for the VOICES fundraiser dance at Smith House, 400 Sayre Dr., from 5-9pm. Contradances and Irish dances will be taught! The 15th annual Somerset Folk Harp Festival at the Hilton Parsippany, 1 Hilton Court. Private event at the Towne House from 4-8pm. Kathy is teaching and performing at the annual Harpers' Escape at the University Inn & Conference Center. South Jersey Irish Society monthly Hoolie from 8-11pm at the Knights of Columbus Hall. Kathy playing harp for a private wedding at 5pm. Kathy playing harp for the Gift of Life Donor Remembrance Ceremony at The Palace at 12:30pm. Kathy & Dennis are being inducted into the Delaware Valley Irish Hall of Fame at the Commodore John Barry Irish Center, Emlen & Carpenter Streets at 8pm. To reserve your seat for the dinner at this event, click here. Thanksgiving Ceili for the Philadelphia Ceili Group's Friday night Ceili at the Irish Center from 8-11pm. South Jersey Irish Society Christmas Hoolie from 8-11pm at the Knights of Columbus Hall, Broad & Elm Sts. We're playing at a private event 12-3pm. We're the ceili band for the Philadelphia Ceili Group's Friday night Ceili at the Irish Center, Carpenter & Emlen Streets at 8pm. cancelled Anchoring the monthly session at Tir na nOg, 1324 Hamilton Ave., from 3-6pm. The Bordentown Historical Society presents its annual “Ballads of Irishtown Concert” at Carslake Community Center, 209 Crosswicks St., at 7:30pm. Tickets are $10. For information, call Diane at 609 298-3779. Concert at the Cranford Community Center at the Cranford Public Library, 220 Walnut Ave., at 7:30pm. Free. Kathy playing the harp for the St. Patrick's Day Observation Committee's annual dinner at the Doubletree hotel at 5pm. We're playing for the church service at the Church of the Loving Shepherd on Front St. at 10am. Our annual St. Patrick's Day outing at Murphy's Market at Taunton Forge 11am-3pm. Dennis will anchor the ceili band for the South Jersey Irish Society's monthly hoolie at the Knights of Columbus Hall at 8pm. Kathy will be playing harp for a private wedding at 4pm. Dennis and Kathy are being inducted into the Comhaltas Ceoltoiri Eireann Hall of Fame at the annual convention and Fleadh Cheoil at the Hilton Parsippany, 1 Hilton Ct., Parsippany. Ceili to begin at 9pm. Performing at the New Jersey Folk Festival on the lawn at the Eagleton Institute at Rutgers University at various points in the day. Tribute to Ed McDermott workshop on the Pinelands stage at 1:30pm. Free. We will be playing on the AJ Meerwald, sailing out of Burlington, starting at 1:30pm. Details on tickets for the sail will be posted soon! Kathy will be performing a program for the Ladies GAR in Haddonfield at the Mabel Kay House at 1pm. Concert at the Cafe 420 coffeehouse at the First Presbyterian Church, 420 Farnsworth Ave. at 7:30pm. Tickets $15 at the door. We're performing at a private event at the Bradford Estate from 5-6pm. 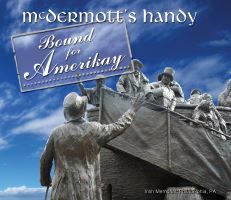 McDermott's Handy will be performing a special Bound for Amerikay show at the 25th annual Cape May Music Festival, sponsored by the Mid-Atlantic Center for the Arts. Concert at 8pm at Convention Hall. We're performing for the Bloomsday event being sponsored by the Free Library of Philadelphia Foundation at the Trinity Church from 5:30-9pm, including a special selection of songs James Joyce referenced in Ulysses. The 14th annual Somerset Folk Harp Festival at the Hilton Parsippany, 1 Hilton Court. Kathy is doing a musical lecture on the harp for the Ladies Tea fundraiser for the Southern Ocean Medical Center new Emergency Room fund.at 1pm. Teaching and performing at the annual Harpers' Escape at the University Inn & Conference Center. Performing at a private corporate event at the Zimmerli Art Museum from 6-7:30pm. South Jersey Irish Society Christmas Hoolie from 8-11pm at the Knights of Columbus Hall, Broad & Elm Sts..
Kathy is doing a Christmas program for the Haddonfield DAR chapter at 1pm. Performing Christmas music at 4:30pm at the Plumstead Presbyterian Church, 14 Front St.
Newcastle County Irish Society monthly dance, 1301 South Rodney St., 2-6pm. Admission $12. Potluck. Kathy performing on harp for the art gallery opening for the Archway Programs at the Camden County Library from 5-8pm. Playing for the Philadelphia Ceili Group's Friday night Ceili at 8pm. Kathy playing harp for the St. Patrick's Day parade committee dinner at the Doubletree hotel. Concert & fundraiser for the Bordentown Historical Society Music at the historic Old Friends Meeting House, 302 Farnsworth Ave. at 2pm. Tickets 10. Call Diane in advance to reserve tickets at 609 298-3779. Seating is very limited. Performing at the Annenberg Center for the Performing Arts, 3680 Walnut St., before the Natalie MacMaster show. Murphy's Market at Taunton Forge from 11am-3pm. Concert at Friends Village, 1 Friends Dr., at 6:30pm. Private event. Concert at the North Edison Branch of the Edison Public Library, 777 Grove Ave., at 2pm. Church service at the Church of the Loving Shepherd on New St. at 10am. Anchoring the Irish session and performing on the main stage at the New Jersey Folk Festival on the Douglass campus at Rutgers University. McDermott's Handy will be opening for Girsa at the 24th annual Cape May Music Festival, sponsored by the Mid-Atlantic Center for the Arts. Concert at 8pm. Kathy playing harp for a private event at the Wyndham hotel from 1-3pm. Anchoring the seisiun at Tir na Nog, 1324 Hamilton Ave from 1-4pm. The 13th annual Somerset Folk Harp Festival at the Hilton Parsippany. CD Release Party for Bound for Amerikay at the Center for the Arts in Southern New Jersey, 123 Elmwood Rd. from 2-5pm. Help us celebrate. Concert at 3pm. We're anchoring the Trad Night at the Shamrock Festival, sponsored by the Gloucester City Irish Society, from 7-10pm. On the waterfront. Performing at the 39th annual Philadelphia Ceili Group Irish Music and Dance Festival. Kathy is teaching at You Gotta Have Harp's Harpers Escape Weekend with Grainne Hambly, William Jackson and Debbie Brewin-Wilson. Sign-up deadline is Sept. 15. We're the ceili band for the South Jersey Irish Society's teach-in at Our Lady of Good Counsel, Main St. at 7pm. Demos and teaching of easy ceili dances. We're leading a traditional Irish seisiun for the South Jersey Irish Society 's outreach at Palmyra Harbour. Open to all, listeners in particular. Everybody brings a refreshment to share. 7:30-9:30pm. Playing at a private wedding. Our Irish Christmas concert at the Wall Library, 2700 Allaire Road at 2pm. Free. Our Irish Christmas concert at the Willow Grove Presbyterian Church,1961 Raritan Rd., at 3pm. Meet the instruments introduction to the concert at 2:30pm. Reception to follow. We're playing the dance music for the Friday Night Ceili at the Irish Center, Carpenter & Emlen Sts., at 8pm. First Friday Series Concert at the Old Bridge Public Library, 1 Old Bridge Plaza at 6:30pm. Kathy performing for the Women's Club at 1pm at the Westfield Masonic Lodge. Concert at the Manasquan Public Library, 55 Broad St., at 7:15pm. Free. Concert at The Elms of Cranbury at 2:15pm. Our usual performances at Murphy's Market, Taunton Forge from 11am-4pm. We're playing for the church service at the Church of the Loving Shepherd on New St. at 10am. Kathy performing at the Haddon Fortnightly, Kings Highway, at 2pm. We're the ceili band for the CCE meeting at the MacSwiney Club at 7pm. Concert at the South Brunswick Public Library, 110 Kingston Lane at 2pm. Free. We will be anchoring the Irish session at the New Jersey Folk Festival on the Douglass campus at Rutgers University from noon-1pm on the Shore stage. Dennis will be playing with Lesl Harker on the Pinelands stage at 4pm for the Mike Rafferty Tribute. Kathy is playing harp at a private event from 11:30am-1pm at Emeritus at Voorhees. Kathy is playing harp from 10am-1pm at the Azalea Festival at Sayen Gardens. Free. Performing at the grand opening of the new Cape May Convention Center for the 23rd annual Cape May Music Festival, sponsored by the Mid-Atlantic Center for the Arts. McDermott's Handy will be opening for the Masters of the Celtic Harp. This inaugural event for the Convention Center will be free but you should reserve tickets by calling 609-884-5404. Concert at 8pm. We will be anchoring an Irish session for Reunion Weekend at Princeton University at 7:30pm. Kathy will be playing a private event at the Indian Springs Golf Club at 6pm. We will be playing at the Mackay Center at the Princeton Theological Seminary College at 6pm. Kathy will be teaching at the GMG Harp Forum all week! Register to attend. The 12th annual Somerset Folk Harp Festival at the Hilton Parsippany. Art gallery reception at Emeritus at 7pm. Kathy teaching at You Gotta Have Harp's Harpers Escape Weekend with Grainne Hambly, William Jackson and Debbie Brewin-Wilson. Sign-up deadline is Sept. 30. Private event at the Smithville Mansion at 3pm. House party sponsored by Comhaltas Ceoltoiri Eireann Philadelphia branch from 7-9pm at the MacSwiney Club. Workshop & session at Kildare's, 18 W. Gay St.
Concert for the Cranford Public Library at the Cranford Community Center, 220 Walnut Ave., at 7:30pm. Kathy playing harp the St. Patrick's Day parade committee luncheon at the Doubletree hotel on Broad Street at noon. Private party at the Grange Hall from 2-5pm. Church service at the Church of the Loving Shepherd at 10am. Concert for the Manasquan Public Library , 15 Broad Street., at 7:30pm. Concert for the Weekhawken Public Library , 49 Hauxhurst Ave. , at 7pm. Our usual performances at Murphy's Market, Taunton Forge from 12-4pm. Playing at the opening reception of the Smithsonian's New Harmonies exhibit at the West Deptford Library, 420 Crown Point Rd., at 7pm. Performance with the Next Generation of Traditional Irish Music and anchoring the Irish music session at the New Jersey Folk Festival, Douglass campus, Rutgers University. Kathy performing at the Sayen Garden's Azalea Festival from 11am-1:30pm. Kathy performing at Summerville Assisted Living from 5-6pm. Concert for the South Jersey Acoustic Roots Music Society at the Medford Arts Center, 18 N. Main St. at 7pm. Irish session to follow. Harp performance at Rutgers University in Geology Hall on the Old Queens campus from 2-4pm. Private event at the Holly Hedge estate. Education outreach school programs sponsored by the Mid-Atlantic Center for the Arts. Performing at the Inspirational Irish Women award ceremony at the Irish Center at 3pm. Second gig of the day at 8pm at the Mad Batter in Cape May. Opening for the Pride of New York for the Mid-Atlantic Center for the Arts concert series. Star of the Sea church on Washington St. at 8pm. 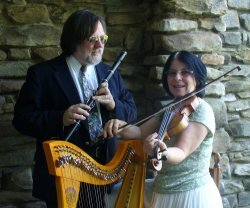 Harp and flute workshops at 6pm followed by the monthly session for the Irish American Assn. of Northwest Jersey at 7:30pm. Kathy teaching at the GMG Harp Foum all week. Lake Hiawatha Library, 449 Halsey Rd. at 7pm. The 11th annual Somerset Folk Harp Festival at the Hilton Parsippany. Concert for the North Arlington Public Library, 210 Ridge Rd., at 7:00pm. Concert at the Margate City Public Library, 8100 Atlantic Ave., at 6:30pm. Free. Kathy playing harp at a wedding from 5-7pm. Dennis playing for the Newcastle County Irish Ceilidh at 2pm. Church reception at St. Mary's Churcy, Springdale Rd., 12:30-3pm. Kathy teaching at You Gotta Have Harp's Harpers Escape Weekend with Grainne Hambly, William Jackson, Debbie Brewin-Wilson and Sharon Knowles. Sign-up deadline is Oct. 1. Kathy performing for the Gift of Life Donor recognition ceremony at the Venice Plaza. Private function at the Manor at 7pm. Kathy performing for the Gift of Life Donor recognition ceremony at the Brandywine Country Club. Kathy performing Christmas music on harp at the Madigal Night for the Haddonfield Methodist Church, Warwick & Kings Highway from 6:45pm-9:30pm. Concert for the Civic Center Association at 7:30pm. Concert at the Secaucus Public Library, 1379 Paterson Plank Rd., at 2pm. Free. A special St. Patrick's Day concert hosted by the Historical Society of Riverton at the Porch Club, 4th & Howard Streets at 7:30pm. The Down Jersey Celtic Celebration with Kevin Burke at the Frank Guaracini Fine & Performing Arts Center at Cumberland County College on College Dr. at 3pm. Private wedding at Valley Green Inn from 11:30am-3pm. Wedding at the Shadowbrook at 5pm. Dennis playing tinwhistle and flute in the Celtic Christmas concert with the Jubilate Deo Chorale & Orchestra at Paul VI high school at 2:30pm. Christmas Eve service at Redeemer Lutheran Church, 2384 E. Landis Ave. at 11pm. Concert at the Monmouth County Library, 125 Symmes Dr. at 2pm. Free. A special St. Patrick's Day concert at the Princeton Public Library, 65 Witherspoon St. at 7:30pm. Program for the Haddonfield Historical Society in Greenfield Hall at 6pm. Gallery 50, 50E. Commerce St., one year anniversary party from 6-9pm. Harp workshop followed by the monthly session for the Irish American Assn. of Northwest Jersey. Private event at Carlucci's at 1:30pm. Azalea Festival at Sayen Gardens at 1:30pm. Teaching and directing the You Gotta Have Harp summer camp. See web page for details and to sign-up. Directing the 9th annual Somerset Folk Harp Festival. See website for details and to sign-up. Kathy will be doing her musical lecture on the harp in Irish history at the Vineland Public Library, 1058 E. Landis Ave. at 6:30pm. Performing at a private reception at the Douglass Student Center. Performing and teaching at You Gotta Have Harp's 17th Annual Harpers' Escape Weekend. See website for details and to sign-up. Kathy will be performing at the Gift of Life Donor Recognition ceremony at 1pm. Kathy will be performing at the Gift of Life Donor Recognition ceremony at 1pm at the Brandywine Country Club. Irish Christmas concert at the Aubudon Public Library, 239 Oakland Ave. at 6:30pm. "They are ...a virtual folk orchestra"